Businesses shouldseek to work with leading-edge clients to promote innovation. Thats one piece of advice from Innovate now! 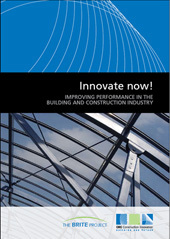 ― a new free guide for improving performance in the building and construction industry through innovation. The guide is tailored to meet the needs of an industry under pressure to innovate by distilling the findings of Construction Innovations BRITE project, which examined 12 innovation case studies and conducted large-scale surveys of the industry.Construction Innovation has created an introductory guide to eBusiness for small businesses in the building and construction industry. By unpacking the elements of innovation, Innovate now! simplifies and demystifies the processes required for becoming more innovative. Construction industry representatives have commended the guide for uncovering innovation drivers and demonstrating that innovation is applicable to businesses of any size. In terms of the drivers of innovation, the guide identifies that small- and medium-sized enterprises were generally well equipped to exploit the opportunities created by client-driven innovation and that crises, also strong drivers of innovation, should be viewed as opportunities and triggers for improving project relationships and communication. Innovate now! leads the reader through the six steps to improve their innovation performance which include identifying opportunities for innovation, building and maintaining effective relationships and anticipating obstacles to innovation. Produced by the eBusiness Adoption project team, 500 copies of the guide have been purchased by both the Master Builders Association (Victoria) and the Building Commission (Victoria) to distribute to members/clients. To make taking action easier a series of checklists enable the user to assess their organisations readiness for innovation and the value of existing staff-related practices. Innovate now! advises that clients, consultants, manufacturers and new graduates are key sources of innovation and provides a template for developing and using these and other relationships to achieve innovation goals. From that point users are in a position to start developing an innovation program suited to their business and to share their successful innovation broadly within the construction community which has traditionally had a tendency to hoard successful ideas. In addition to highlighting renewable energy sources such as solar arrays, fuel cells, and wind turbines, the Green Dorm at Stanford University will also incorporate numerous conservation features to minimise its consumption of energy and water. This project led Jennifer to join a student group working with the project design team to discover sustainable pathways and develop a case study around Life Cycle Assessment. Her case study questions whether a steel or a wood structural system is more sustainable, taking seismic events into account. The dorm will be located in Palo Alto, California a highly seismic region near the San Andreas fault. The structural design will aim to withstand the large earthquakes that are likely to occur during the life span of the dorm. She will use seismic loss probabilities to model earthquake damages, and then allow LCADesign to calculate the total environmental impacts. 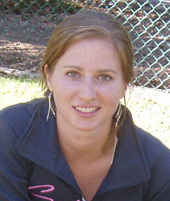 Her time in Australia was spent populating a database specific to the Stanford project, and then composing the associated reasoning rules. Schematic design of the Green Dorm is scheduled to begin at the end of September 2006, throughout which she will be documenting how LCADesign aids the project team during early design.